The “Jeanie B” comes to Oriental a few times during the summer. 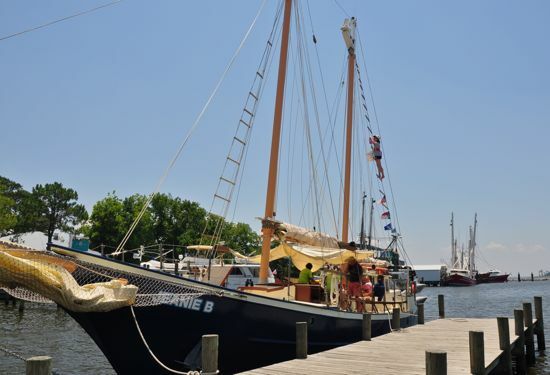 One of those visits came Wednesday as a crew of 8 teenaged girls from Camp Seafarer navigated the 72-foot schooner to the Town Dock. They’d just done an overnight passage from Ocracoke, leaving Silver Lake after sunset and arriving in Oriental Wednesday morning. 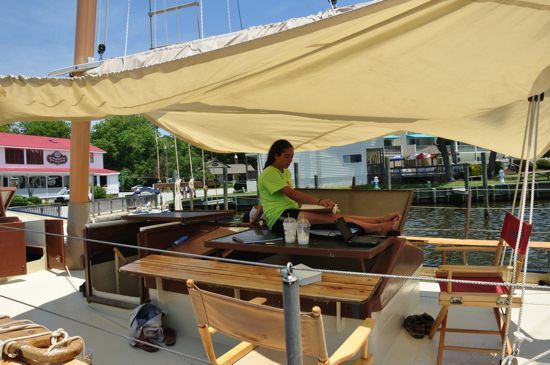 The teen-aged sailors — and the 4 adult counselors on board — were winding down a two-week voyage across and up and down the Pamlico and Albemarle Sounds. They’ve been to Belhaven, Alligator River, Manteo, the Outer Banks, Ocracoke. 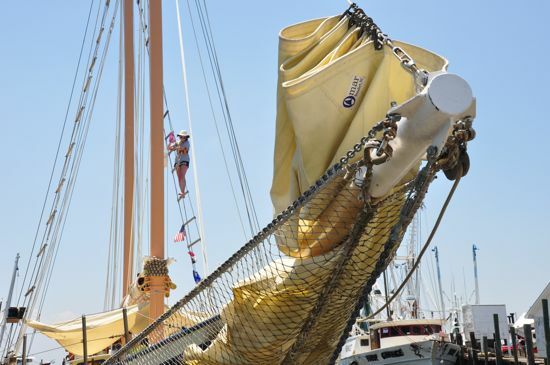 Distinctive bowsprit of the “Jeanie B” while at Oriental’s Town Dock. His company Lundy Charters runs the “Jeanie B”, and Baker says that since taking off from Camp Seafarer over a week earlier, neither he nor any of the other three adults have steered the “Jeanie B.” They’ve taken a hands-off approach and left the navigation, steering and other big decisions to the 8 teenagers. Jim Baker in front of the “Jeanie B” run by Lundy Charters. Just over a decade ago, he was a teenaged crew member on a similar two-week trip out of Camp Seagull. He’d gone to the camp for 8 summers, worked two as a camp counselor before going off and becoming a captain and now running Lundy Charters. In addition to the obvious ways — sail trim and steering — some of that ownership comes by way of putting in to practice techniques — such as knot-tying and navigation — that they’d been taught before getting on the “Jeanie B”. The bow of the Jeanie B. That concept of “owning” the boat extends to maintaining it as well. As Baker spoke on the Town Dock, one crew member was high in the ratlines above the “Jeanie B” deck, applying teak oil to the wooden slats of the ladder. Tending to that wood wasn’t just for the aesthetics. 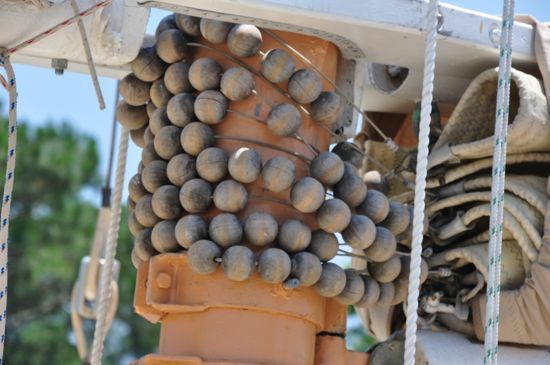 Jim Baker said it was also a safety issue. The takeaway lesson was that an oiled piece of wood would be protected from rot for longer, offering reassurance about the foothold if one ever had to go up in to the rigging. Someone had to oil the teak of the ratlines. Emma Wheeler who recently moved to Oriental was one of the 8 teenaged girls who crewed on the “Jeanie B” for the past two weeks. Doing maintenance work was part of the experience. Emma Wheeler and the ratline teak. 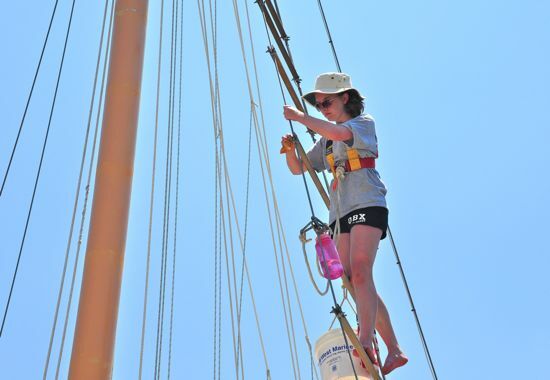 A little while later, finished with her teak chores, Emma Wheeler was back down on the deck of the “Jeanie B”. 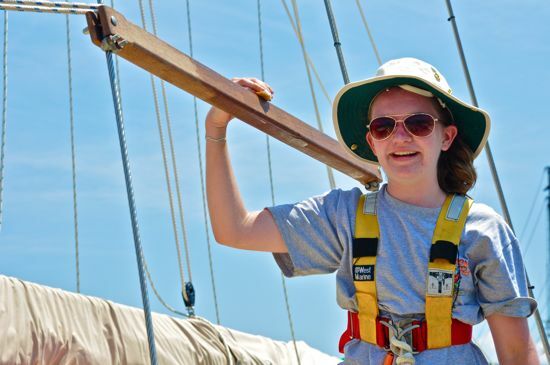 She said sailing the large schooner required “a lot more teamwork” than the Optimist pram she first learned to sail on just two years ago at Jim Edwards’ Bow to Stern Youth Sailing Camp in Oriental. The leap from the 8-foot dinghy built by volunteers to the 72-foot boat was not lost on Emma’s mother, Camilla Wheeler. A chance to relax. Midship on the “Jeanie B” where some crew took shelter from the sun and read and napped. Camilla says that when Emma was 3, she and her younger sister and their parents lived aboard an Island Packet for a year, cruising from Maine to the Exumas. Once back in Winston-Salem, they didn’t sail much. A few years ago, the Wheelers bought a house in Oriental and began spending summers here. When Jim Edwards opened the Bow to Stern kids sailing camp in 2008, Emma and Kara signed up. They learned to sail on Optimists, then moved up to Sunfish and 420’s. Emma, Camilla says, developed a passion for racing the Sunfish. On Wednesday, Camilla Wheeler, speaking at her new shop, Nautical Wheelers, at Broad and Hodges, was full of praise for the start the Bow To Stern sailing camp had provided. Later this summer, Emma will be back there, this time teaching other kids how to sail. Parell balls on the “Jeanie B”. Meanwhile, the “Jeanie B” will likely be making another visit to Oriental in the next two weeks. 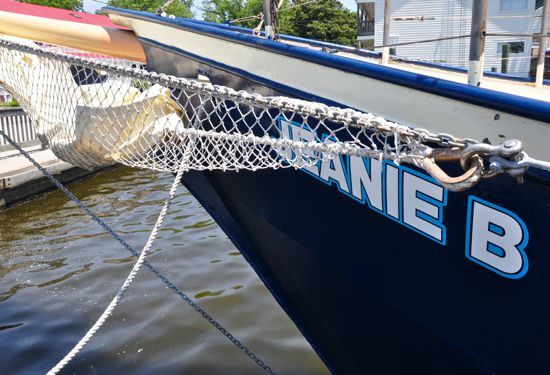 While the teenaged girls’ trip is over, a crew of 10 boys, also 14-15 years old, will be sailing around the Sounds on the “Jeanie B” starting next week. After that, the gaff-rigged, 48-ton boat will be heading to its home, a slip along the waterfront in Morehead City. 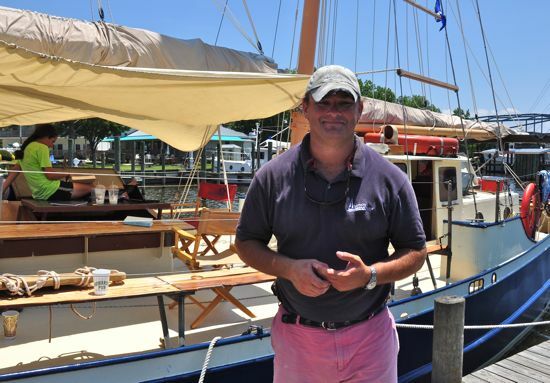 Though built for off-shore cruising — Jim Baker says the boat does beautifully in heavy wind — the “Jeanie B” spends the rest of the year doing charters in and around Beaufort and Morehead City. Previous life: Did dolphin charters between Florida and the Bahamas.